This salad screams summertime! 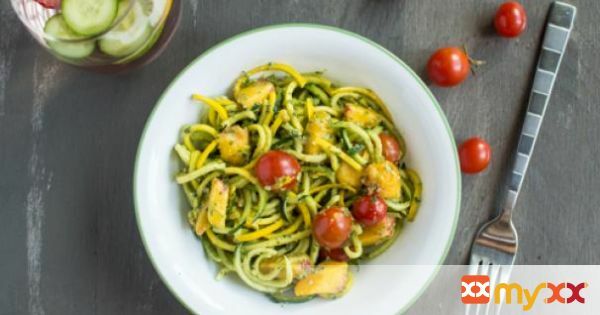 Fresh summer squash noodles are paired with juicy yellow peaches, sugar-sweet cherry tomatoes, and tossed in a bold pesto sauce. ***If you do not own a spiralizer, you can purchase squash/zucchini that is already spiralized or see other options listed in directions below. *** Grab a fork and dig in! 1. In a food processor, blend the basil, oil, nutritional yeast, lemon juice, miso paste, salt, garlic, and walnuts together until smooth. Set aside. 2. Once the squash has been spiralized, I like to give all the noodles several rough chops so that they're easy to eat (otherwise, the noodles are too long). Chop up the parts of the squash that did not get spiralized and add them to the salad. **If you do not have a spiralizer, create vegetable noodles with a julienne peeler or vegetable ribbons with a regular peeler. 3. In a large bowl, toss the noodles, diced peaches, cherry tomatoes, and 1/3 to 1/2 cup of the pesto sauce together. 4. Store the unused pesto and leftover salad in separate containers and refrigerate.